This coffee table ottoman held up very well. We had it for years and it never broke - even with the abuse young children can provide. The top eventually got stains - I would recommend applying a stain guard on the fabric and washing off spills or dirt quickly. I am happy with the purchase. It looks a lot more expensive than it is. 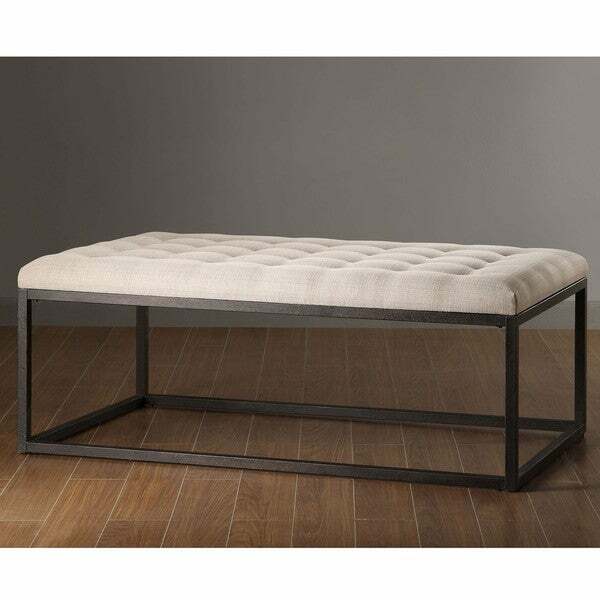 Take a seat at this stylish and modern ottoman bench. Its minimalist style and open metal base provides the perfect foundation for the chic tufted polyester upholstered top. Filled with comfortable foam filling, this bench can be used as additional seating, foot rest, or even as a coffee table. Attractive Product, but will it last? I really liked everything about this coffee table - the design, the metal used for the legs and base, the color and texture of the fabric used for the top. It's hefty and solid, not something that will sway if someone sits on it or rests their legs on it. It looked pricey, without the crazy price tag. The only problem was the sizing . . . it was a little too wide and too tall for our furniture and living room. I realized, after purchasing it, that I really prefer a coffee table that is a little lower than the top of the seat cushions on our sofa. I just like that look. This table is 18" high, our cushions top out at 17 1/4. The length of the table was good, but it was unusually wide. Again - would look perfect in a different living room, but not ours. It seemed to "take over" the room. Sad, because I really liked it. Comfortable as a foot rest, we put a tray on it for a coffee table. Looks great! I love this coffee table. I like the modern farmhouse look and this coffee table is perfect - the linen like fabric looks nice and the table itself looks high end but fortunately it wasn't expensive. My original plan was to recover the table when it arrived but i liked the linen look fabric that was on it so i kept it as is and it fits my decor perfectly. I adore this ottoman/coffee table. It is an expensive looking piece and has a lot of weight to it which reinforces the quality. The fabric is a beautiful linen style weave, but very durable compared to a normal linen. I have a chaise lounge in a similar color from Z Gallerie and the quality on this ottoman is much higher than on the Z Gallerie fabric. I would recommend this piece to anyone looking for a simple, streamlined look but with soft corners perfect for little ones and clumsy adults alike. I'm really happy with this table/ottoman. It is well made and looks really nice. The top is firm as others mentioned, but it's still comfortable to rest your feet on and also provides a sturdy surface for a tray. It was bigger and heavier than I expected which was nice. It was also easy to put together. The top is a bit darker tan than shown in the picture. The metal is a very dark brown/bronze color. I have it in my living room with black and beige furniture and it looks great. I sprayed it with Scotchguard before using which I would recommend although if you did have to reupholster it down the road it seems like it would be a fairly easy job. At first I was a little bit nervous about this purchase based off a review that I read but boy was I happy that I took the chance! It is very comfortable, looks high end and durable,and there is no concern with sharp corners. The metal base accentuates the industrial look I am going for but the fabric softens up the look. It is very important to look at the close up pictures of the fabric as it is more beige/oat meal then off white. Moreover, the price could not be beat! The coffee table came in 5 business days and everything was included in the package that allowed for a quick assembly; It took me less than 30 minutes to assemble it by myself. The only tool you will need that is not included in the package is a screw driver. If you are worried about storage, you could pair this up with a serving tray and you could store a couple of large baskets underneath. Overall, I would definitely recommend this to a friend and could not be more satisfied with my purchase. Well, for this price I was expecting around **** quality. it is 100x better than expected. I could have paid 3x the price for this item else where. I am so happy with this piece! The ottomon is very high quality with a nice linen fabric so not cheaply made and great to use as a coffee table with a tray or as extra seating! Easy to assemble but a bit heavy which I didn't mind as it is sturdy and well made! Definitely a great buy and very attractive! I really like the looks of this large ottoman. The tufting is a nice touch that balances out the metal base. We have kids and dogs and figure the fabric will get ruined over time - there's just no getting around it but the reason I picked this piece is because once the cushion part wears out, I plan on removing it and putting down wooden planks so it goes from ottoman coffee table to just coffee table. Perfect and just what I was looking for! Modern twist on the ottoman coffee table! Fits perfectly with my sectional. I put a tray on table to put books, remote, etc. fabric seems durable. Looks nice with charcoal grey couch. We were so pleased and easy to assemble as well. Product is as pictured, sturdy, and cheaper than similar items from other distributors. Love this coffee table... Not the greatest if you plan on putting drinks on it frequently, but we have a tray on ours, which has worked great. It's heavy and awesome quality. Also easy to clean. Would definitely recommend! This is great ottoman! Comfortable to sit on or rest your feet. Looks stylish. Perfect ottoman for the price tag! Loved this and always got a ton of comments. Very sturdy, my daughter use to play on it and built forts under it. Sadly when we sold our home they requested to keep it. Need to buy again! I have owned this piece for at least three years. 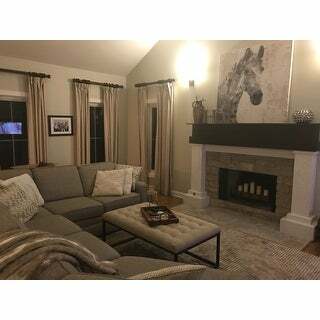 The taupe color is very neutral (color is not too cool, not too warm) and looks great with any color scheme. It is a solid piece, easy to assemble and cleans up (thank you, kitty!) much better than I could have anticipated. My family loves the piece so much, my son and daughter in law asked for one for Christmas, thanks to Overstock, I just shipped it straight to them. How easy is that? Not a small piece but very solid and well built. I use it as an ottoman at the end of the bed. Worth the price and easy assembly. Elegant and versatile, can put baskets underneath for blankets/pillows. Very nice - but returned... Not exactly the look I was going for. "What color are the metal legs? Black or gray?" "I see that Overstock doesn't "weight test" the products. Can any current owners attest to how sturdy they feel the ottoman is? Can it double as a bench for 2 people? Would you trust it as a true ottoman? Or does overstock have records of complaints or returns based on this?" We recommend reading the reviews. It is a metal frame and is sturdy. "Is this Coffee Table Ottoman comfortable to put your feet up on?" Unfortunately this is more of a personal opinion. By looking at the reviews the customers seems to be very pleased with the ottoman. I hope this helps. "Hello. Do you know what the dimensions are for the box that the ottoman will be shipped in? Also, how much would the entire package weigh roughly? I need to figure out if it will fit in my car." Box dimension - 51-1/2" X 31-1/2" X 6-3/4". Gross weight - 56 lbs. "I am looking to place poufs underneath this, what is the height in between the metal on the floor and the metal on the top?" Hello ohkayt, the distance between the metal legs to the base is approximately 13.5 inches. Thank you for shopping with us. "Would you describe the color as taupe or greige, or is it more of a true tan?" Hello Bridget76, the color is more taupe in my opinion. We try to represent the colors of our products accurately. Unfortunately, due to the difference in monitor colors we cannot guarantee that the color will match exactly what you see on your screen. Thank you for shopping with us. Had ordered another fabric top ottoman coffee table but product was defective. This is a good alternative and price was right. Also, liked the detailed reviews I saw. Take a look at some of the many ways you can use storage ottomans in your own home. Shop and save money on our great selection of ottomans. How to Clean an Ottoman from Overstock.com. Because ottomans are the object of much use by feet and shoes, they need an occasional deep cleaning. Here's how to clean your ottoman easily and effectively. Tips on Coordinating an Ottoman with Your Living Room from Overstock.com. Our guides provide customers with information about Tips on Coordinating an Ottoman with Your Living Room.